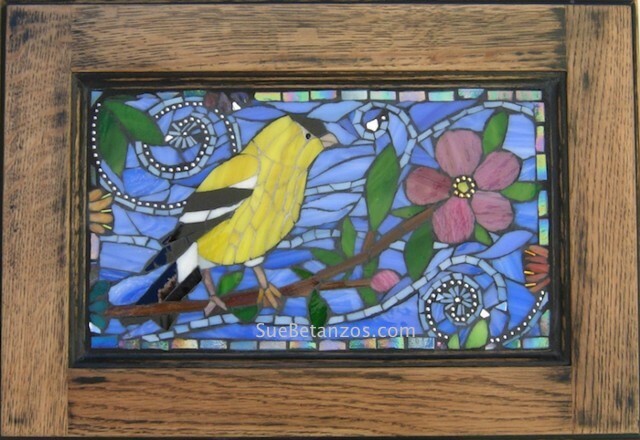 A cheerful Goldfinch to accent your home or office where it will make a difference Every Day. Goldfinches are easy to spot with their yellow coloring and can be seen at backyard bird feeders. Gift yourself or someone special with this cheerful mosaic. The mosaic is on a permanent, hand finished heavy wood frame. It comes wired, ready to hang. Free Shipping in the USA! USPS Priority only. International buyers contact me for different shipping fees. Contact me for commissions on different songbirds, wildlife.